Above: setup used for comparisons. 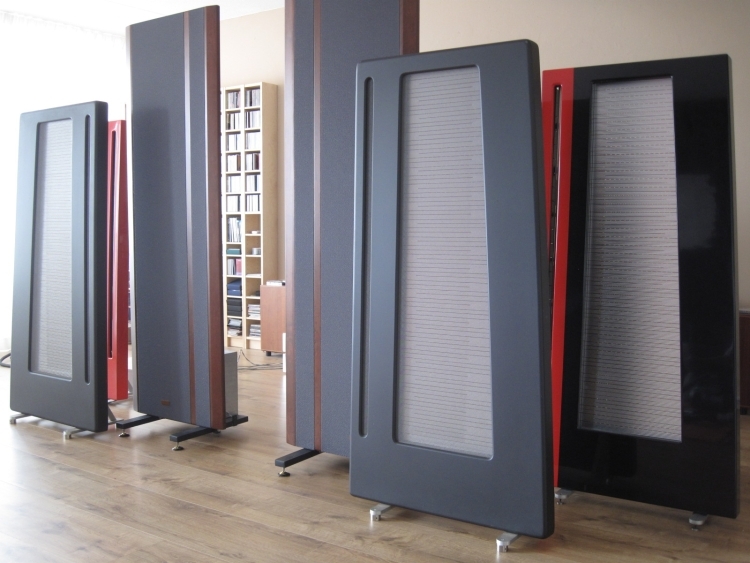 There’s no way around it and reviewers at the time weren’t wrong: Full Range Apogees really are something special. Most incredible is their bass performance: at once deep, full, dynamic and fast. All three sets of Duetta Signatures produce bass in a fashion that makes visitors wonder if the subs are still on. Second: they’re incredibly dynamic and fast, in a way that makes Magnepans seem overly well-behaved and sleepy. Lastly, their timbre is very, very good. Piano really sounds like the percussion instrument that it is. The Magnepan MG3.6R by comparison often make piano sound too thin, almost like it is a keyboard and not the real thing. 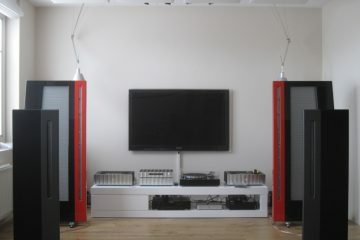 And I’m talking about the Maggies with aid of two REL Strata II subs. The Magnepans have tight, articulate bass, but there’s no real drive to speak of. There are advocates for both camps, each accusing the other camp’s speaker of having coloration. 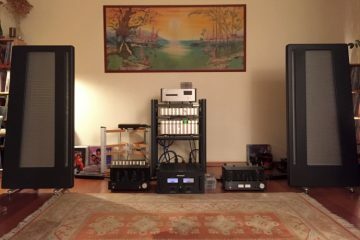 I think both have valid arguments: yes, the Apogees can sound too hard and even a little metallic in the midrange, depending on circumstances and equipment matching. And yes, the Magnepans sound restrained and somewhat veiled, compared to Apogees. But they’re both great speakers and the Magnepans have at least one big advantage over Apogee DS, which is their treble, which is quite simply sublime. Apogee DS treble by comparison is less refined and less airy. In case of the DS with modified crossovers the treble is even coarse, forward and a little shouty. 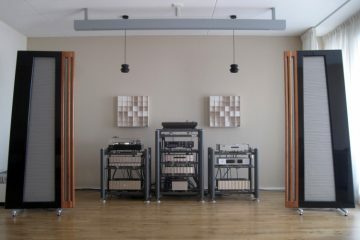 The 2 original pairs both had more fluid treble than the refurbished set, but were both less lively and articulate. The liveliest of the two was still less fluid than the Magnepans and still slightly hot in the treble. The oldest pair was arguably not shouty or hot and actually quite fluid, but also very relaxed. Too relaxed for me. While it could be argued that perhaps the Maggies sweeten the treble too much and perhaps the original DS’ treble performance is simply honest and revealing what’s on the recording, the refurbished pair definitely had too much treble energy. But that’s because the crossovers are non-standard and have tipped-up treble. On balance though I find that all Duetta Sigs sound more real than the Magnepans and I simply enjoy them more, and more actively. Music sounds more real to me, more like a live performance, and it grabs me more because of it. So, while I thoroughly enjoy the Duettas, and the refurbished pair is clearly more live, and life-like than the Magnepans, they can also be pretty harsh throughout the midrange and treble. It is my quest to see what happens if these refurbished speakers are connected to original crossovers. Above: the home made crossovers with which the Red and Black Duettas were purchased. Quality components and made with care, but deviating from the classic Apogee sound. 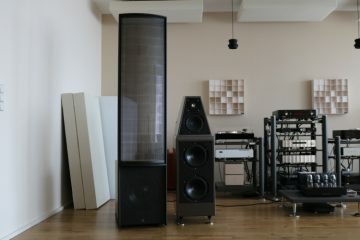 Above: original Duetta Reference crossover (still in its donor speaker). 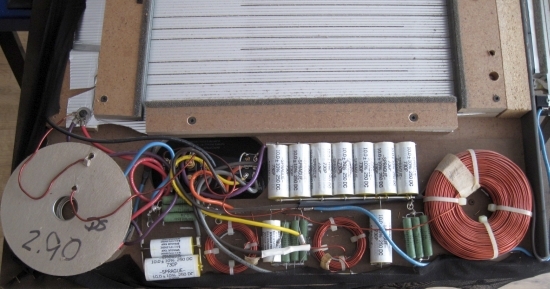 The only difference with the regular Duetta Signature crossover is the addition of the square red capacitor visible behind the MRTW coil on the right. 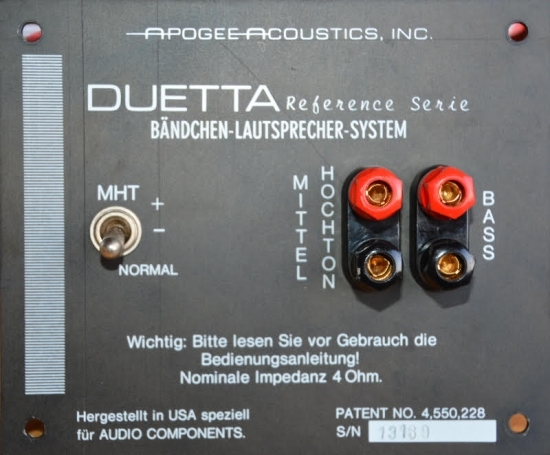 Above: binding post of the Duetta Reference donor speakers. 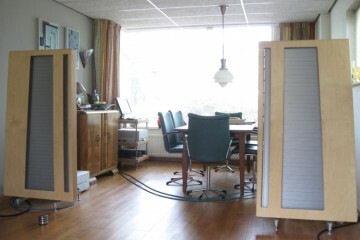 This set was about to be refurbished by Henk van der Hoeven, Dutch Apogee restorer. 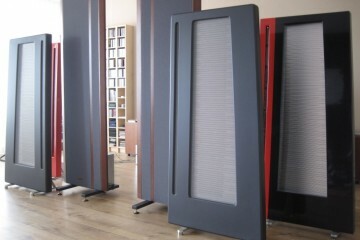 The speakers would also receive new crossovers so the old ones were superfluous. It’s interesting how sometimes puzzle-pieces just fit together. 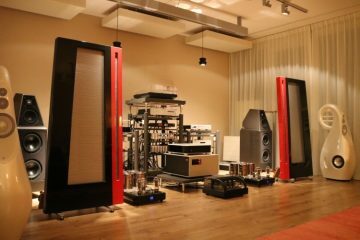 After I posted the announcement for an upcoming review of a new breed of Apogee-like speakers by the name of Clarisys, the state of JW’s Red ‘n Black Duetta Signatures became an active subject again. 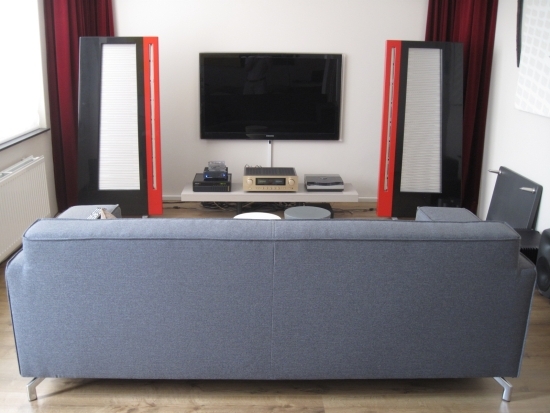 Although these speakers have been fitted with new KLM2 bass- and MRTW ribbons and have very nice new front covers, their crossovers home made and non-standard, and I’ve always found them to be too forward and brittle in the treble at times. Although JW’s red ‘n black Duettas have been stored at my place since forever it seems, they are not my own. I use Divas and am very happy with them lately. JW himself has been using an original pair of DS and is completely happy with them, so the thought of modding the DS’ crossovers was never a very pressing one. 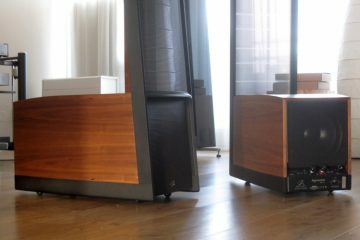 Anyway, when I spoke with Graz and Henk van der Hoeven (official Dutch Apogee restorer) about the upcoming review of the Clarisys speakers, they agreed that the DS needed to be brought up to spec, and Henk was more than happy to help me with this. And so he donated a pair of original crossovers for me to connect to the Red ‘n Black DS. Interestingly, the original crossovers that Henk provided are not for Duetta Signature, but for Duetta Reference. This is a special version for the German market, complete with terminal back plates with German lettering. Naturally I rather had a pair of truely original DS crossovers, but Henk assured me that the only difference was the presence of a single square red capacitor. Just to be sure, JW also carefully checked the schematics and photos of several DS pairs, and concluded that this is indeed correct. 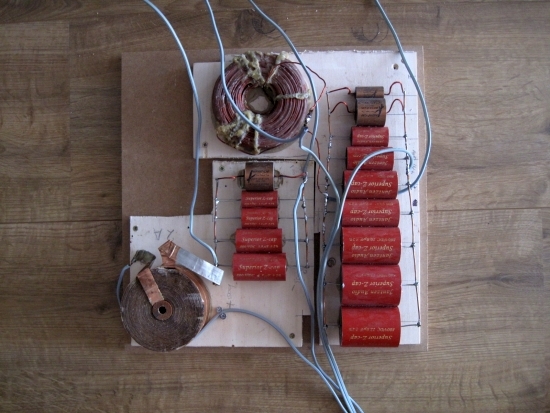 Above: originally the crossovers are mostly glued to a thin wood board but some parts such as the woofer coil and the connectors are screwed to the cabinet. 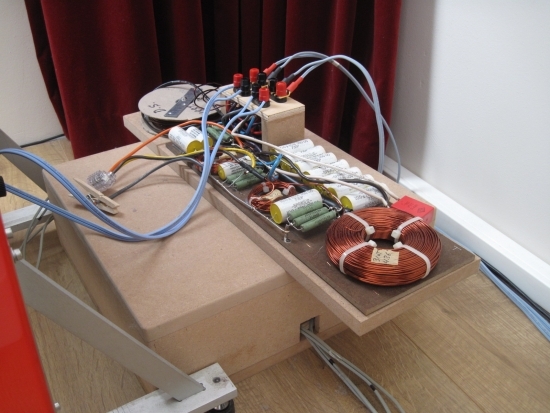 I put all components together on a piece of MDF together with new connectors that are the same as the originals. 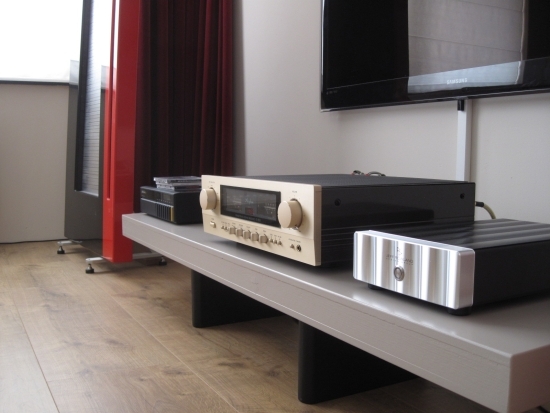 Using an Accuphase E260 integrated amp, we prepared for a one on one listening session. 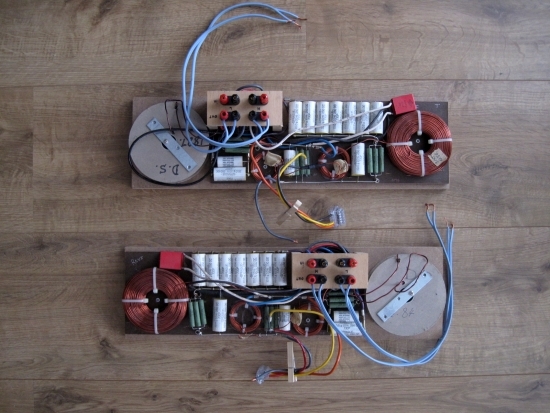 The original crossovers had their switches removed and had been hard-wired in the same configuration as the modified crossovers are: treble in the HI position. Still the original crossover was missing a few components but closer than this I could not get. First impression switching from the home made crossovers to the originals is a feeling of much more coherence. Top to bottom all frequencies seem to be more balanced. The sound is also a little thinner, cleaner if you will. Bass has less bold power but still reaches as deep and seems more nimble and articulate. There’s even better low level detail and longer decay on subtle sounds. 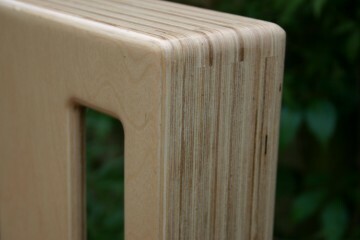 Treble while still hot, is also much more refined and fluid. Already I’m liking the old crossovers. Now switching to treble NORMAL, things get even better with even more coherence and treble loses much of its edge. Still, the treble can be peaky or metallic and this is something that I do not recognise in the original pairs, nor in my Divas, which also have been fully refurbished. I have a feeling that either the implementation of the new tweeter foils, or the foils themselves, is not optimal. 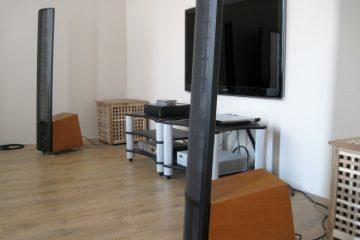 Mind you these tweeters were not installed by Henk but by the previous owner. But even if they were installed correctly, they may have deteriorated. 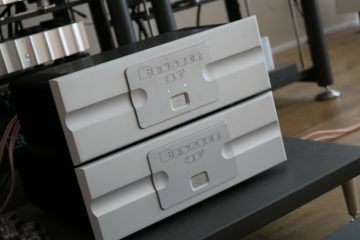 And even if Apogee treble tends to become smoother with the years, none of the original pairs I heard had treble like these refurbished ones, which still seem off-balance, even with original crossovers. In speaking with Graz about this he recommends going for the latest KLM-5 tweeter models, which he says are much improved. Since these are JW’s speakers, this decision is ultimately his, but I think this will happen at some stage. If it does, I will certainly update this review. This crossover experiment was sparked by the pending review for Clarisys speakers, but these are still not released. You never know, but I’m not holding my breath anymore. 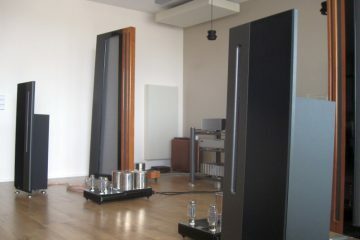 Right now, the original ones, or new models directly from Graz are the way to go. As mentioned before: be careful when modding a crossover. Sure you could potentially improve things in certain areas, but the original crossovers are already of very high quality and chances are that you’re actually degrading the sound, even if you use better, more expensive components. The balance can be quite delicate indeed. One of the first things you loose with mismatched components is cohesion and transparency.